I’ve been tussling with a difficult issue for a while now. Do I continue as a wholly impartial blogger, totally unconnected to any financial business? Or do I work with carefully selected businesses that share my goal of improving investor outcomes? It hasn’t been an easy decision, but I’ve finally made up my mind. I’ve spent the last five or six years writing about the problems in the global asset management industry — the conflicts of interest, the lack of transparency and the widespread absence of value. It’s been hugely frustrating at times. Most of the work I’ve done for little or no financial reward. And I’m proud of the progress I’ve made. The time has come, however, for a change of course. Investing really is changing for the better, and all around the world, new and innovative companies have emerged, that are finally giving consumers the value and service they deserve. What’s going on in the investing industry is nothing short of a revolution. And I don’t just want to write about it; I want to be part of it. It gives me great pleasure, then, to announce my appointment, as Head of Investor Education at RockWealth LLP a financial planning firm based in the Regency spa town of Cheltenham in Gloucestershire. 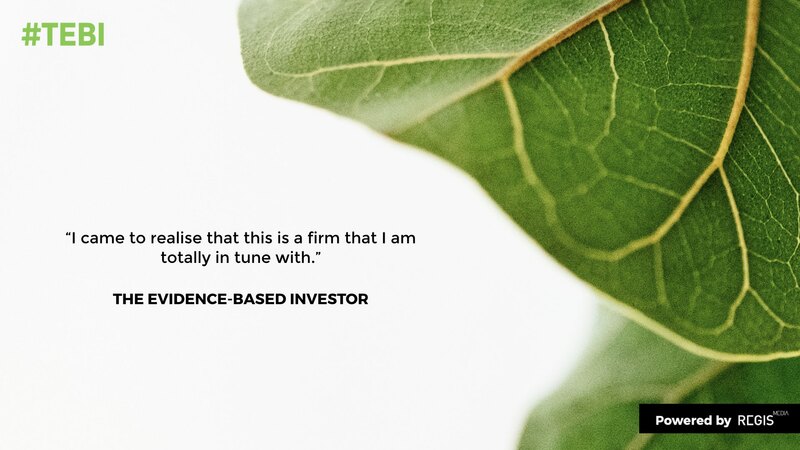 My colleagues and I at Ember Regis Group spent several weeks last year working on a documentary for RockWealth called Investing: The Evidence. In the course of making that film, I came to realise that here is a firm that I am totally in tune with. As you would expect, it has a thoroughly evidence-based investment philosophy; it believes passionately in the importance of financial education; but, most important of all, the firm is built on the fiduciary principle, and an absolute insistence on putting the interests of the client ahead of its own. It is, for me, the perfect fit. I’d like to reassure TEBI readers that The Evidence-Based Investor will carry on exactly as before. My rôle with RockWealth is a part-time one, and my commitment to this blog remains as strong as ever. There are exciting improvements to the TEBI website already in the pipeline. Our sister blog Adviser 2.0 will carry on as normal too. Nor does this mean that I’ll stop working with other evidence-based advice firms, either in the UK or overseas. Regis Media, our boutique provider of content and social media management to advisers, is growing fast. We’re busy making plans for new documentaries and videos series, specially tailored for every English-speaking market. We also plan to produce more content in Dutch and German, and in other languages too. I’m equally keen to work with other disruptive companies in the asset management space, such as fund managers, robo-advisers and financial technology firms. I’m also going to be working with specialist law firms seeking redress on behalf of investors who’ve suffered at the hands of large financial institutions. It is, in short, business as usual. For now, it only remains for me to thank my new RockWealth colleagues Tim, Matthew and Mark, for giving me this opportunity. I won’t let you down. What’s a journalist doing at a financial planning firm?